Today I wandered down to the most out of the way church I’m likely to visit here in Roma. 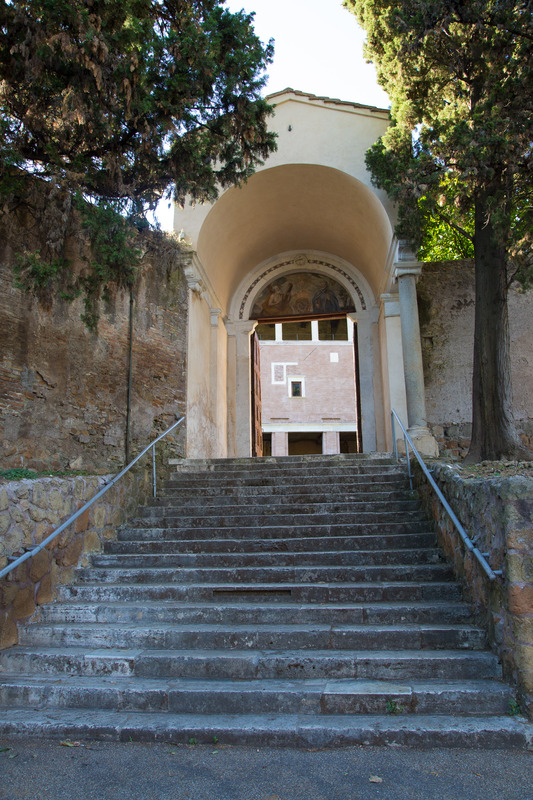 San Saba is about a quarter mile northeast of the Piramide subway station, several stops southwest of the Colosseum in a quiet neighborhood. … and a building that doesn’t look much like a church. I got there before 9. No tourists, no one at the door to collect money, in fact, no place to make your donations that I could find. Just a quiet spot with a few souls making peace with themselves before starting the day. And the place is perfect. The original church was started by St. Sabas monks who fled their monastery in the Judaean Desert after a massacre by Persians. 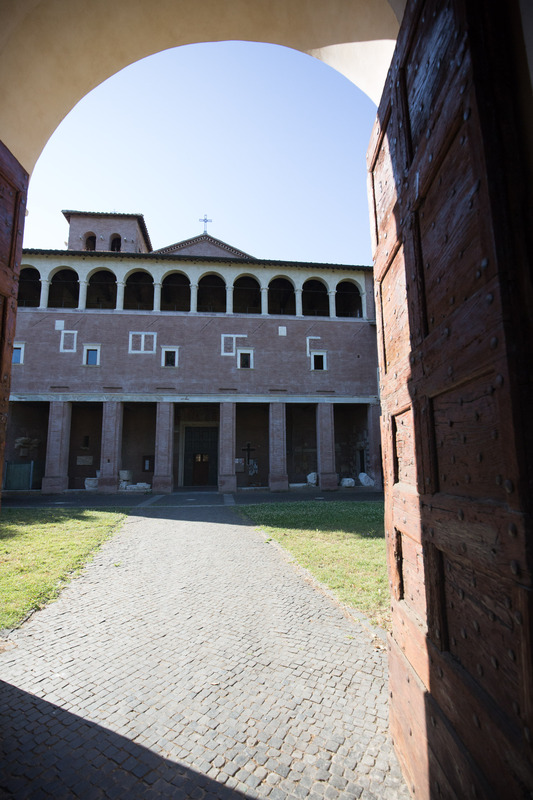 The monks came to Rome and started an Orthodox Christian monastery in the countryside in the early 600s. 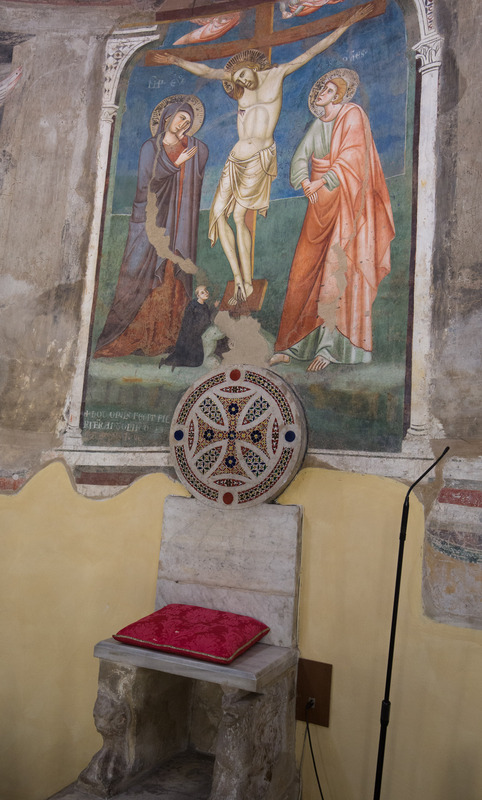 The relations between the Catholic and Eastern Orthodox churches went sour after a couple of centuries and the site was used for a new church built in the 10th Century. The interior with the rafters and old style architecture is all from that era. The mosaic style floor is also typical. There’s a 13th century throne behind the main altar. 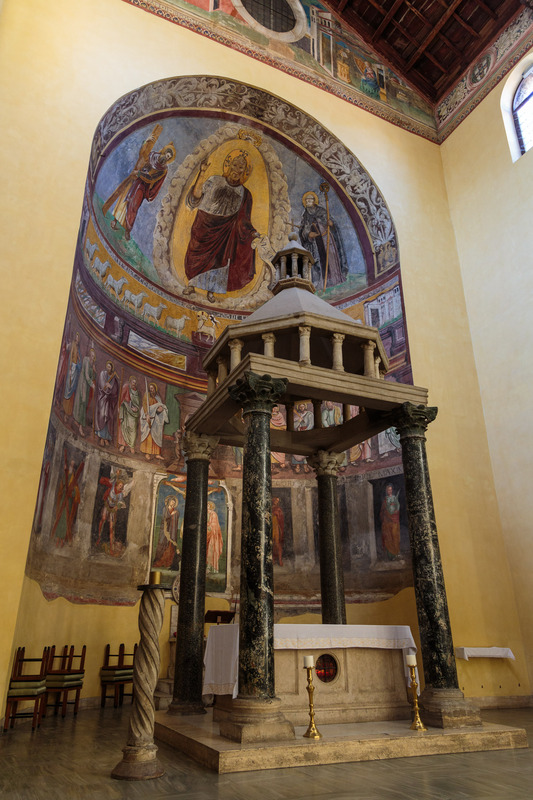 The apse wall has frescoes from the 13th century. 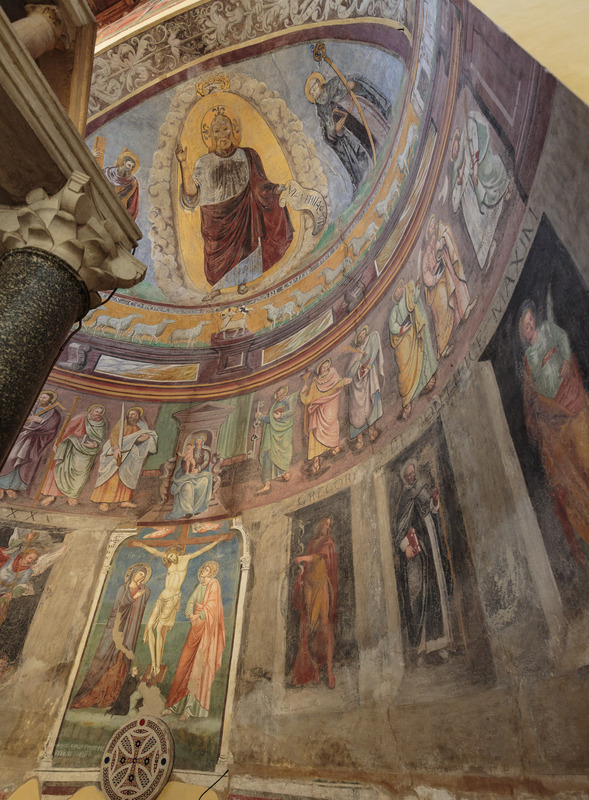 The upper register has the Madonna and Child flanked by the apostles, and the lower one has a fresco of the Crucifixion flanked by saints. They’re all in the old Medieval/Byzantine style. 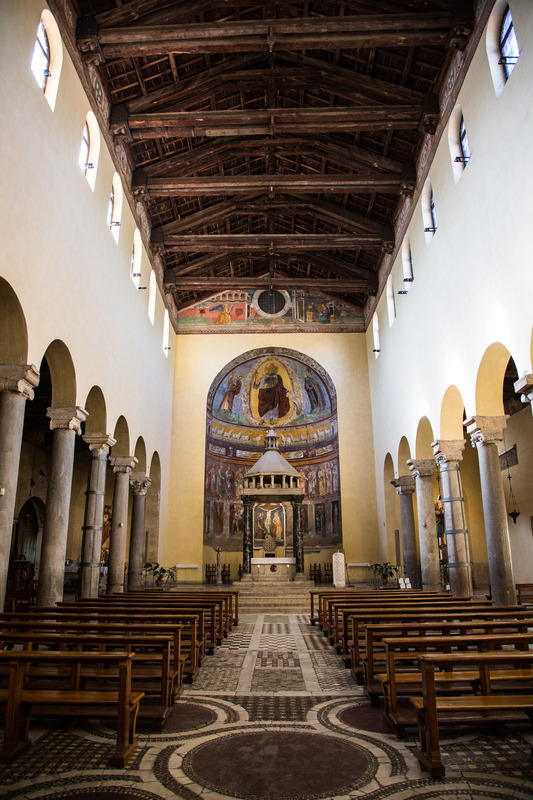 On the left side of the church, a fourth aisle preserves several other frescoes from the 13th century. They’re all in fairly rough shape. 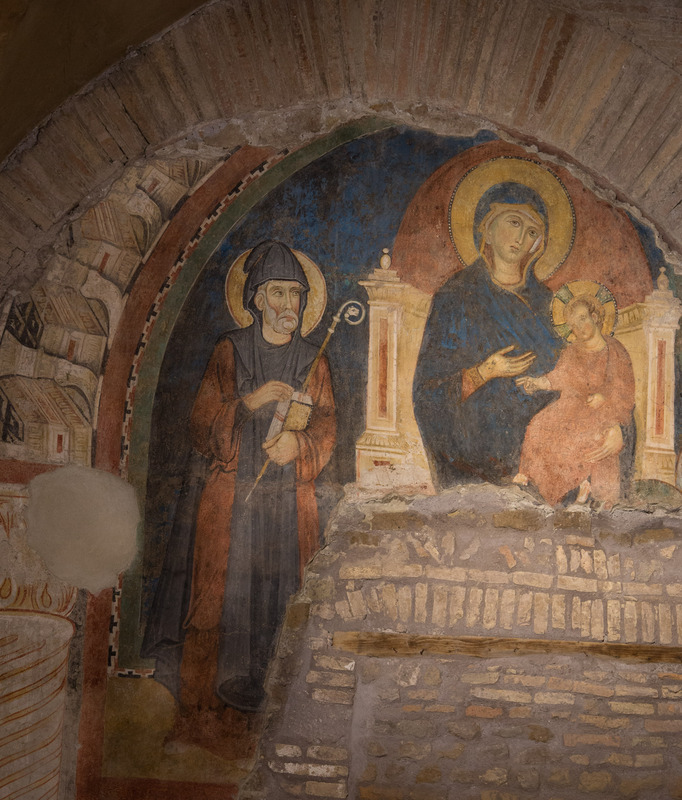 This one shows the Virgin and Child with St. Sabbas. It’s a simple church, off the beaten path. And the quiet charms of the place are more appealing to me than the fanciness and crowds of St. Peter’s.